With the SE PA streams being high and off-color and the salt being completely torn up - - it was back to the Pine Barrens in search of the chain pickerel. On this outing they did not disappoint. From the get go they were all over the droppers and poppers. The visuals were pretty cool. They would just slice thru the water and make a beeline for the fly - blowing-up the topwater! Yellow seemed to be the color of choice. A nice stretch of weather is on the horizon so look for the salt to pick-up. 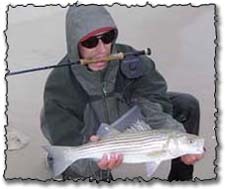 There is no way the bite is over - water temps are still warm....mid-50s. Persistence! Recently our fishing has pretty much come to a halt, but we were able to sneak out for a bit over the past few days....and hit up few SNJ bass and pick lakes. The first water we hit took a beating from the heavy rains and high winds of last week. It was pretty roiled up, and very little vis. 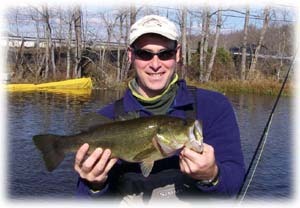 However, the group did manage one 3# PLUS largemouth on a small streamer fished as a dropper off a popper. With not much more action and still some daylight left, we motored over to a nearby lake and got into a few pickeral. Throw in a couple of panfish as well. As the afternoon wore on the winds slacked and the lake became like glass. Talk about a nice way to spend a late November afternoon. Recently we've been out helping the LCFA and the LRSA fingerling stock the Lehigh. FYI...come spring the PFBC has agreed to stock fingerling is areas they have never put them before - all the way down to Palmerton. 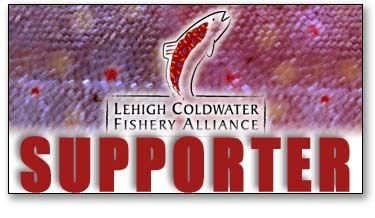 This is definitely a step in the right direction when it comes to managing the Lehigh as a coldwater fishery. Lehigh Coldwater Fishery Alliance (LCFA) float stocking the Glen Onoko stretch of Lehigh. 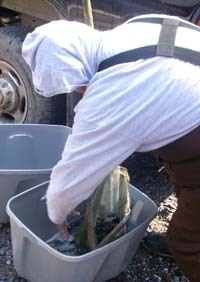 fingerlings into the transport bin. The salt action continues to be relatively consistant. For the past few weeks the bait has been a steady stream along the beach front - heading north to south. Some days the preds push the bait over the bar, some days it does not...but you can pick up fish on the blind even if you do not see bait in tight. When the boats are getting the action far offshore and you can barely make out the bent rods - blind fish!!! Just work the water. Remember...you can not catch a fish, if your fly is not in the water. Big flies - 6" - seem to be working better...and with the blues around we've been fishing them with wire bite guards. once again on the northern Jersey beaches - LBI north! Just get out there now and look for the bait! This is here today, gone tomorrow type of action - you just need to put in your time. Lehigh notes...A must read is the recent Morning Call article titled 'Unleashing the Lehigh.' Front Page - Sunday Edition!! Talk about a comprehesive and fluid topic....pun intended - they did a great job though! The feature gives a fantastic overview of just about all the factors at play when it comes to Francis E Walter Reservoir management.